This circuit enables you to display four signals simultaneously using only one channel of your oscilloscope. Essentially, it switches each of the inputs through to the output in turn, with some signal massaging in between. As shown, it is suitable only for low-frequency signal measurement and does not include over-voltage protection at the inputs. 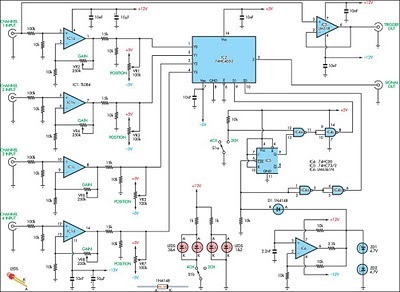 Each input circuit is identical, utilising one amplifier from a TL084 quad op amp package. Looking at channel 1, the input signal is attenuated by a factor of 10 by the 100kΩ and 10kΩ resistors before arriving at the non-inverting input of IC1a. A 15kΩ resistor in series with the op amp output along with a 10kΩ resistor to ground provide additional attenuation. Vertical (voltage axis) adjustment is made with VR2, which sets the gain of the amplifier. This is used to calibrate or scale the displayed signal against the actual input voltage level. Using the values shown, the gain can be adjusted from unity to about a factor of 26. Note that the output of the op amp must be limited to ± 10V so that the voltage into the 4-channel multiplexer (IC2) does not exceed ± 5V. Therefore, with a gain of unity, the input voltage can range from ± 100V, whereas with a gain of 26, it must not exceed about ± 3.85V. VR1 applies a positive or negative DC offset to the output of the op amp. This can be used to compensate for op amp input offset voltage. It can also be used to shift the vertical position of the trace on-screen to provide multiple trace separation. Note, however, that any offset will consume part of the available output swing and therefore limit signal measurement "headroom". Each op amp output is connected to IC2, a 4-channel analog multiplexer. The logic levels on "S0" & "S1" (pins 9 & 10) determine which input channel is connected to the "Z" output (pin 3). A square wave oscillator and divider circuit are used to toggle the "S0" and "S1" pins in sequence to first select channel 1 briefly, then channel 2 and so on. 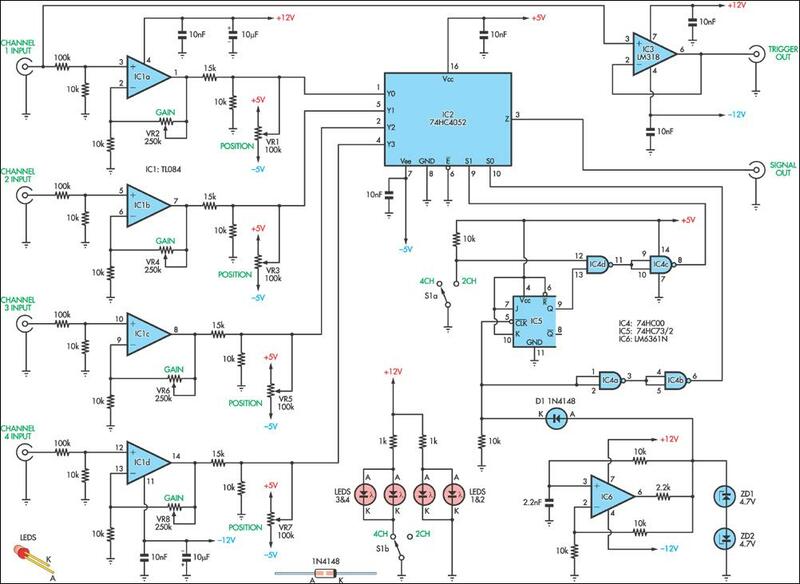 An LM6361 high-speed op amp (IC6) forms the heart of the oscillator. It operates at about 20kHz. Back-to-back zener diodes at the output clip the voltage to TTL levels, after which diode D1 passes the positive half-cycle to the input of one gate of a 74HC00 quad NAND device. IC4a & IC4b "clean up" the signal before if is applied to the S0 input of IC2. A 74HC73 J-K flip-flip (IC5) divides the oscillator frequency by two. This is used to drive the "S1" input when in 4-channel mode. In 2-channel mode (switch S1 closed), one input (pin 12) of IC4d is pulled low, which effectively holds the "S1" input permanently low. Finally, a separate buffer circuit (IC3) is used to provide a trigger signal for the oscilloscope. This is needed because it would be difficult to trigger reliably on the main output as it switches rapidly between the four signal sources.